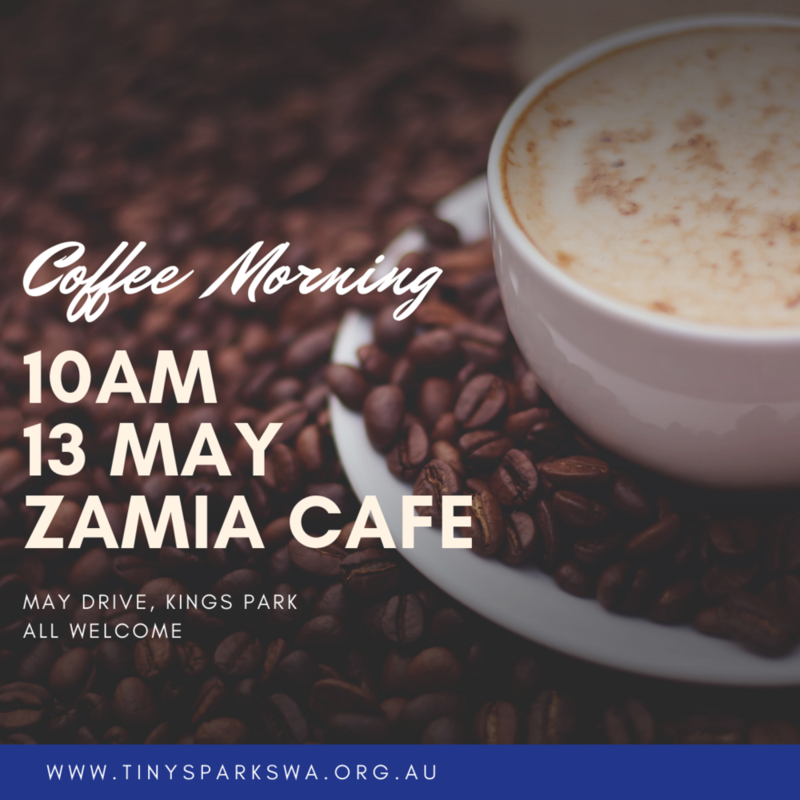 Our monthly informal Coffee Mornings are a wonderful way to connect with the community. Each month we choose a new location to ensure as many people as possible are able to come to a gathering, not too far from home. Everyone is welcome to come along including parents, carers, extended family and Crafty Creators. Topics of discussion typically revolve around pregnancy, birth, the Neonatal Unit and the challenges that lay beyond. If you have a cafe you love be sure to let us know and hopefully we can add it to our roster for later in the year! We look forward to meeting more of you throughout 2019. Some babies are admitted to Neonatal Units for several hours and some for many months. This has considerable impact on parents, siblings, extended family and staff, a true ripple effect. Each baby is unique, each stay is unique but for most it is totally unexpected. Being separated from your baby isn’t what was planned. The babies admitted to Bunbury Regional Hospital Neonatal Unit generally stay 1 to 7 days. Their parents may be feeling overwhelmed and isolated during that time. We are pleased to announce expansion of our Care Package Program to Bunbury Regional Hospital 🎉 With thanks to volunteer delivery driver Sharni, each month BRH Neonatal Unit will receive 30 ‘Special Care Packs’ for distribution to babies admitted to their unit. We are very conscious of expanding our programs in a sustainable way. It is thanks to the generosity of the community that we can continue to grow, and support more WA families each year. The Westfield Country Music Club host The Holt Rock Hoedown in April and October each year. Holt Rock is located approximately 400km east of Perth (about 4 1/2 hours drive) and the Hoedown is hosted at the Strother’s Shearing Shed. This is a great family friendly event! A lovely mix of country and city people coming together to camp and enjoy some country music. We are thrilled to have been chosen as beneficiaries of this event. We would love to see lots of our families there, especially those in the region. Dust off your cowboy boots and hats and practice your ‘yee-haw’! We’ve been participating in the HBF Run for a Reason as an organisation for the past 5 years and it’s always an excellent event! We would love for you to run, jog, wheel or walk your chosen distance as part of our team on Sunday May 19. This year we are hoping to raise enough to complete a special project we’ve been thinking about for a little while. With several hospitals moving to Family Integrated Care (or similar) many parents are spending more time at hospital with their babies. Everyday 10 new WA families are thrown into the chaos that is the neonatal unit. We’ve negotiated discounts and in-kind support, but to achieve all of this we need to raise $7,240. We are so hopeful of surpassing this target, and extra funds will go straight into our Care Package program. If you haven’t already signed up, take advantage of the early bird special and register to be part of our team. Choose ‘Individual’ then ‘I’m part of a team’. The team name is Tiny Sparks WA. 18 February at 10am at Hatched Coffee Shop, Kingsley. 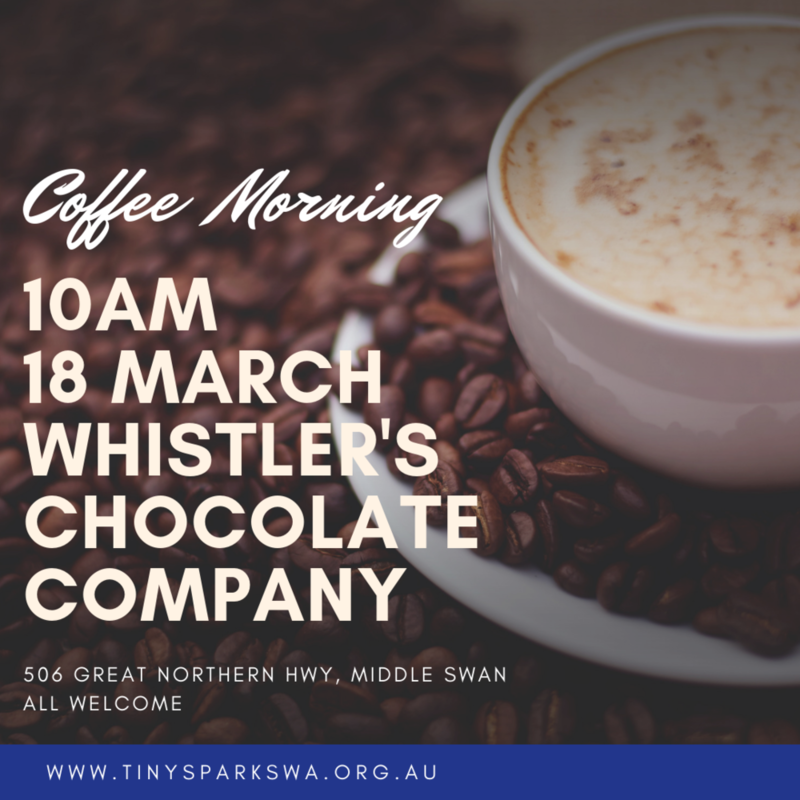 18 March at 10am at Whistler’s Chocolate Company, Middle Swan. 15 April at 10am at Lo Quay River Cafe, Wilson.